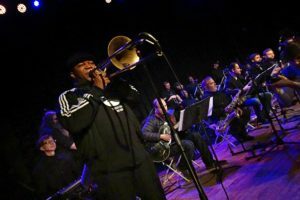 The Marcus Lewis Big Band is a 18 piece jazz ensemble that plays original music, and is based in Kansas City. It’s members are Kansas City’s “top call” jazz section players, and improvisers. The band recently released their debut CD entitled “Brass and Boujee” on August 25th. Marcus released his debut CD in 2012 entitled “Facing East” which features a world class line-up including Logan Richardson on Alto Sax, Adam Larson on Tenor Sax, Pablo Masis on Trumpet, Andrea Lewis on Vocals, Sam Harris on Piano, Aidan Carroll on Bass, and Tommy Crane on Drums. The album was featured in Vogue Magazine as being one the top Janelle Monae’s 2012 Summer Playlist. Marcus Lewis is currently working on music for a new CD to be released in the fall of 2018. Marcus Lewis is the Artistic Director of Future Jazz, a nonprofit dedicated to Jazz Education. Emcee and trombonist Ryan “Kadesh Flow” Davis is a rapper with an MBA, a Trombone Super Saiyan, an Otaku Maven, and a cosplay Padawan. At age 11, ‘Desh, as many of his listeners call him, began rapping and playing trombone within two weeks of one another. Now, he brings realism, consciousness, and otaku thoughts together in riveting flow format.He has composed original music for Toonami Asia and for FUNimation backed anime documentaries, his music has been featured on network television in multiple countries and territories across Southeast Asia, and he has been publicly lauded by outlets such IGN and Kotaku. Locally,Kadesh can be found rocking solo hip hop sets, laying down bone bars with KC funk juggernaut The Phantastics, or jamming with various bands and artists throughout the city. More information regarding Kadesh can be found atwww.kadeshflow.com.